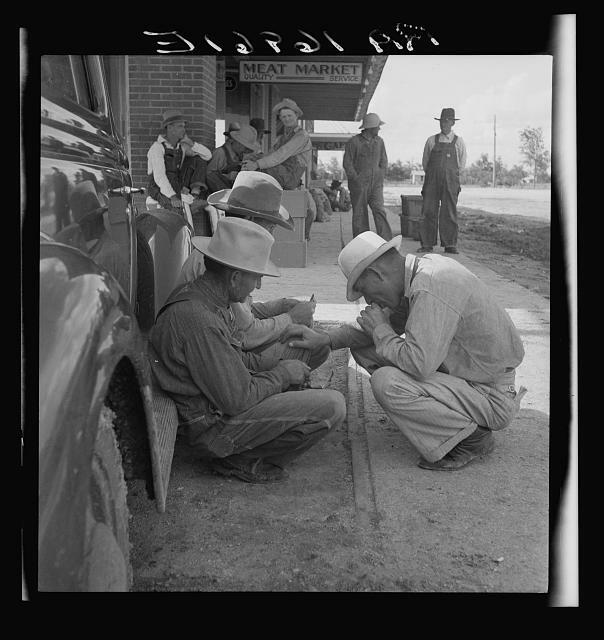 “Brother, can you spare a dime?” became the catch phrase during the Great Depression. Many Americans felt hopeless about unemployment and the inability to sustain themselves. They had suffered the stock market crash, had lost their jobs and homes and at the same time families in the Midwest were forced to flee the Dust Bowl area of the United States. Students will explore these events beginning with the immediate time period which preceded the Great Depression. They will also research the lives of individuals who endured these hardships and examine Americans perseverance during the most “depressed” time in U.S. history. Lesson One: What preceded the Great Depression? social conditions of the late 1920′s using The American Folklife Center. storyboard of the most important facts in 1928 and 1929. Complete for homework. Lesson Two: What is the Stock Market Exchange? a.) One student from each group shares storyboard ideas on 1928 and 1929.
in the late 20′s. Selected vocabulary will be noted for future quiz. take notes and highlight new vocabulary. c.) Homework includes research on individuals who survived “The Crash”. Lesson Four: The Crash — Part Two. b.) Discuss and share notable individuals lives who witnessed this era. Lesson Five: The Great Depression. a.) Students will display storyboard with overview by one member in each group. the website, American Life Histories: Manuscripts from the Federal Writers’ Project. c.) Students will begin reading text on the Great Depression Era. Review for test. Lesson Six: Great Depression — Part Two. Depression Era. Vocabulary words will be highlighted. b.) In the computer lab, students will research and take notes on this tragic time period. c.) Storyboard material is researched on the Great Depression of the United States. Lesson Seven: Great Depression — Part Three. a.) Test on Stock Market Crash and beginning of the Great Depression. interview of a family or individual who lived during this era. Lesson Eight: Introduction to the Dust Bowl. their textbook on the “Dust Bowl” disaster in 1935. Vocabulary words are noted. focus will include how the economy failed farmers and rural living. Lesson Nine: The Dust Bowl in United States History. The Dust Bowl Map Activity. b.) Students use the Smart Board to review the website, Voices from the Dust Bowl. Notes are taken with vocabulary highlighted. Scavenger hunt activity is designed. Storyboards will finish with the Dust Bowl disaster. Questions are due for homework. Lesson Ten: Dust Bowl — A new beginning. a.) The Scavenger Hunt is designed on the Smart Board. b.) Students meet in groups to design the last page of their storyboards. Students Storyboards: As part of the class project, students continually updated their group storyboard to continue a timeline in history from 1929-1936. Student Interviews: Students who researched families or individuals acquired first hand knowledge and familiarity of living in the late 1920′s and early 1930′s. Student PowerPoint Presentation and Activities: Allow students to find slides and information from the American Memory Collection to complement textbooks and videotapes. TECHNOLOGY USED: Laptop Computer, LCD projector with Smart Board, Computer lab, PowerPoint, Video recordings.